Manufactured By – Compañia Del Gramofono-Odeon, S.A.E. Side A (with a 2nd trombone being possibly Tony Thorpe, a 2nd tenor saxophone being either Reg Pink or Harry Carter & 2 unknown violinists) was cut in London on June 16 of 1933 & originally issued on british HMV B-6370. 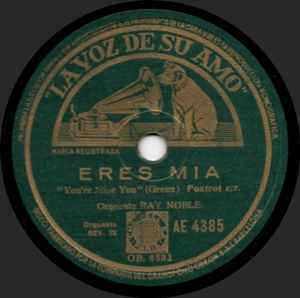 Side B (with an unknown trumpet, 2 unknown tenor saxophonist, an unknown guitar & an unknown string bass) was cut in New York on July 11 of 1933 & it went issued on Victor 24358, japanese Victor JA-167, british HMV B-6403, australian HMV EA-1250, italian HMV HN-104 & german Electrola EG-2799.